Seattle author Sean Beaudoin’s story collection “Welcome Thieves,” his first book for adults, features characters navigating through complicated, gritty lives. “I am the point guard, best player, and team captain. That opener gives a taste of what readers can expect from “Welcome Thieves”: biting wit, introspective characters and irony by the handful. Beaudoin has published five young-adult novels. This collection is his first offering of fiction for adults. His latest book showcases his deep imagination, which spills onto the page in the form of quirky characters and eccentric and at times disturbing story lines. 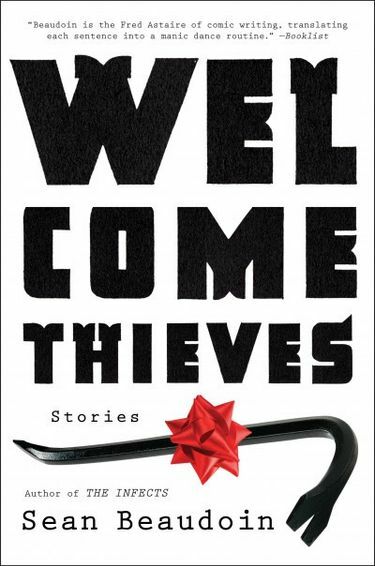 A common theme in “Welcome Thieves” is destruction — of property, of relationships, of opportunities, of the self. Beaudoin’s stories feature characters who tend to be young, white and philosophical, who feel broken or lost, but show some promise. Rarely do they fulfill that promise, but the reader is invited to watch them navigate through their complicated, gritty lives. In “Comedy Hour,” the unnamed narrator is a high-school senior who plays on the school’s hopeless basketball team until an exotic, Eastern European-esque transfer student shows up and becomes a star. Soon after, the team of losers experiences the glory of a winning season — at least temporarily. The narrator hints that he’s ready to bust from his small-town seams. Instead, he self-sabotages his future. What shines most in “Welcome Thieves” is Beaudoin’s sharp, playful and unexpected use of language. His style is what carries the collection, creating a sense of pathos and keeping the reader interested, despite characters and plot lines that feel hard to embrace or understand. In the title story, the reader meets Adam, who falls in love with a girl named Eve while simultaneously falling out of favor with a dangerous vendor of contraband goods. While it’s clear that Adam has smarts, it’s unclear how he could screw up badly enough to land on a hit list. The plot involves Adam trying to nourish his blossoming romance while avoiding the consequences of a deal gone wrong. This is the type of predicament Beaudoin uses to keep the reader both intrigued and appalled by his stories. The push-and-pull technique works for the most part, but at times feels like tired, repetitive attempts at being edgy. In almost every story, drugs show up as a culprit for bad behavior or poor choices. This begins to feel like cliché, a device to advance the story. Beaudoin clearly possesses talent and a distinctive writing style and voice. That alone makes his collection worth a read.